Our partner organisation Forkani recently hosted a workshop with the aim of fostering cross-sector partnerships between health and conservation groups in Kaledupa. The second day of the workshop was about to begin, and I could practically feel the buzz of anticipation from the gathered participants. The district leader, a local government representative, began proceedings with a question. I smiled to myself. It was clear that everyone present was excited to work together towards integrating health and conservation services in their communities. Blue Ventures has been implementing a collaborative Population-Health-Environment (PHE) approach in Madagascar for over a decade, integrating family planning and other health services with community-based marine management initiatives. The PHE approach empowers people to make their own family planning choices, while equipping them with the skills they need to manage their natural resources sustainably. This distinctive style of working empowers people to make their own family planning choices, while equipping them with the skills they need to manage their natural resources sustainably. My role as Blue Ventures’ PHE Support Officer in Indonesia is to exchange some of our PHE learning and experiences with local organisations. Since November 2016, we have been working with conservation organisation Forkani on community-based approaches to octopus fishery monitoring and management in Darawa village on Kaledupa Island. They have been interested in exploring our holistic PHE approach to resource management ever since our Medical Director visited communities in Wakatobi last year. Earlier this year I reviewed the results of these community consultations with Forkani, and together we discussed the unmet health and family planning needs as well as the social and food security issues of Kaledupa’s communities. Kaledupa is a remote island located in southeast Sulawesi, and its isolation increases the challenges faced by its inhabitants. There is no doctor available on the island, and the nearest hospital is approximately 2 hours boat ride away. It was clear from the consultation results that this limited access to health services was a contributing factor to Kaledupan communities rarely having the capacity to engage in effective natural resource management. The Forkani team and I agreed that these results should be disseminated further through a dynamic cross-training workshop, which would also act as a platform to discuss the potential implementation and development of PHE partnerships on the island. To round off discussions, La Beloro, the leader of Forkani, asked his team to illustrate their objectives for this event. All in the same boat. 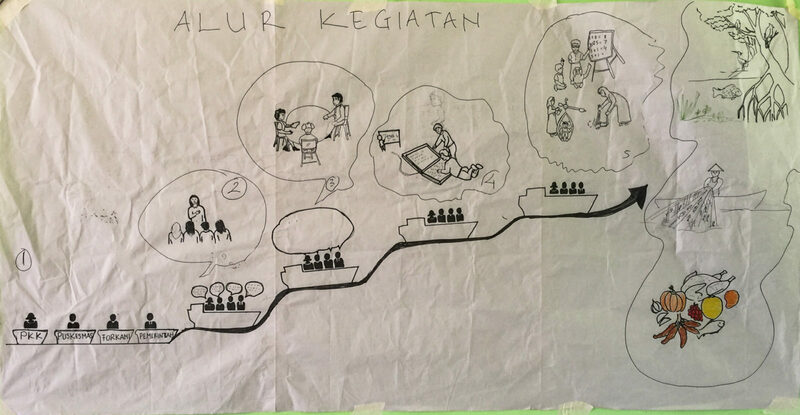 The resulting sketch by the Forkani team shows different organisations coming together and all using the same boat to reach the community. Several weeks of planning later saw Primary Health Centre (PHC: a local health service provider), government representatives from the local district office and some Kaledupan women’s groups all gathered together at Forkani’s invitation to discuss PHE partnerships. The workshop began with an introduction to the PHE approach. By this point the Forkani staff were very knowledgeable on this subject, and I was able to sit back and listen while they explained the benefits of integrating community health services into their existing conservation work in Kaledupa. The message was greeted with enthusiasm. “It makes sense to work together with other organisations in Kaledupa because we are already working in the same area and with the same community,” one of the PHC leaders commented. Each organisation present had the opportunity to share information about themselves and their work before everyone was divided into groups based on location. These groups then discussed the relevant connections between human and environmental health in their specific area, and began to devise action plans for supporting positive behaviour change in their communities. By the end of the two-day workshop, it was decided that a collaborative PHE initiative would be implemented in four villages located around Kaledupa island: Tampara, Darawa, Horuo and Mantigola. It was a remarkably successful cross-training workshop, but now the real work begins to improve human and environmental health in Kaledupa. We have to explore new health-environment connections, maintain coordination between organisations, and of course, start to apply the action plans in the field. As the participants were getting ready to depart, a member of one of the women’s group stood up for a final word. Find out more about our work supporting partners. Ratih joined Blue Ventures in April 2017 as a PHE Support Officer based in Indonesia. She is working to integrate community health promotion and services with natural resource management and biodiversity conservation. Awesome works! !…hope this approach can be implemented in the other parts of Indonesia as well.